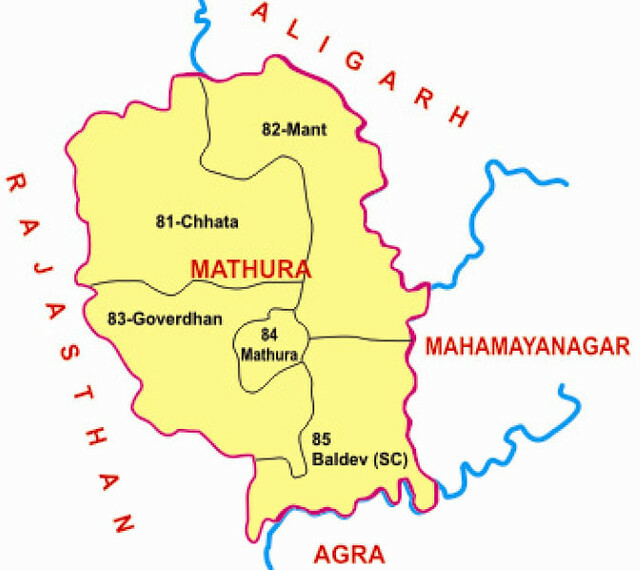 There are five legislative assembly constituency in Mathura district for the 2017 Assembly elections. They are 85 Baldev, 81 Chhata, 83 Goverdhan, 82 Mant, 84 Mathura. When Uttar Pradesh assembly election 2017 is getting ready to electios new Assembly, Mathura is not anywhere behind in the election heat. Mathura District (Hindi: मथुरा ज़िला, Urdu: متھرا ضلع‎) situated along the banks of the river Yamuna is a district of Uttar Pradesh state of northern India. The historic town of Mathura is the district headquarters. The District is part of Agra division. Mathura district is an important pilgrimage centre of Hindus.It is a jaat dominated district.